Isn't that exciting!!! Now whats with these bundles? Well let me tell you a little about them. I still can't believe it myself! Pirate101 will be live within the next month and all of you who didn't get into beta can now get in and play early if you get the bundle. If you want to check out the Forbes article, click here. "It's your first chance at exclusive in-game items that are only available for a limited time before being retired forever! In addition to these great items, you get an one week Head Start on the live game. Note: These in-game items will not be available until the Pirate101 game launches. At the end of Closed Beta, there will be one final character wipe followed by the beginning of the one week Head Start. Then the Pre-Sale in-game items will be given to your account and your 12 Month Membership will begin. Questions by Pirates:What is Closed Beta and how long does it last? Closed Beta is a testing period where a limited number of players can play Pirate101 and provide game feedback. It will last up until the one week Head Start, so players who buy the Boochbeard Bundle early on will have more of a chance to play Closed Beta than players who wait. At the end of Closed Beta, Pirate characters will be wiped one last time. Once the one week Head Start begins, all characters are saved. 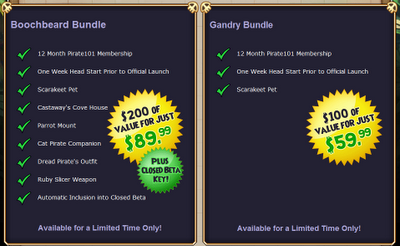 Your 12 Month Membership time will not start until the one week Head Start of the Pirate101 launch. At the end of Closed Beta there will be one final character wipe, and after that the Head Start will begin. Once your 12 Month Membership begins at the one week Head Start, your characters and game items will be saved. What is the one week Head Start? When the Pirate101 game launches, Beta players and people who bought the Boochbeard or Gandry Bundle will get a one week Head Start on the game. The rest of the public will have to wait until the one week Head Start is over, and then Pirate101 will be available to everyone. This one week Head Start gives players to get a chance to quest and progress in the game before everyone else. When do I get my cool new in-game items, like the Parrot Mount and the Castaway's Cove? Just like your 12 Month Membership, the in-game items from the Boochbeard or Gandry Bundle will be available to your character at the beginning of the one week Head Start. No, these items will only be available with the purchase of a Boochbeard or Gandry bundle. They will be permanently retiredwhen these exclusive bundles are no longer available. This is the only way to ever get the Scarakeet pet, Castaway's Cove, Parrot Mount, Cat Pirate Companion, Dread Pirate's outfit, and the Ruby Slicer weapon. No, since these are online only bundles, you will not receive a physical card for the Pirate101 Boochbeard or Gandry Bundle. Will my Pirate101 12 Month Membership Auto Renew? Sweet! I might get the Boochbeard brother for my birthday!